To confirm a quote for your self build garden room please specify your requirements in the additional information box on the online quote form. The DIY Garden Building was developed for home owners who did not want an extension on their houses but a room away from the hum drum of every day living. These rooms can be used for a multitude of reasons. 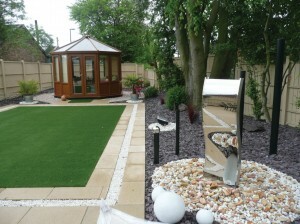 Namely, an outside play area, an office, a spa enclosure or just a room to chill out in, surrounded by just nature. If you are fortunate enough to have a large garden, this is the perfect space as a retreat into you own private bit of heaven. The UPVc DIY Garden building is virtually maintenance free, as opposed to the timber alternative, which has a much shorter life span and constantly requires up keep. As standard these structures come double glazed in the wall frames with 25 mm, five wall polycarbonate in the roof. The panels join by using the K2 Konnect system that does not require skrewing the frames together. An aluminium plate slides down between the two panels and then quarter turn buttons are used to correct the width at each joint. The wall frames arrive fully glazed for a quick and easy installation. 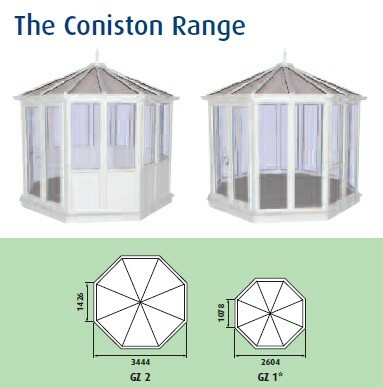 The DIY Coniston Range is a eight facet garden building. As standard it is supplied with 600 mm high infill panels in shiplap. 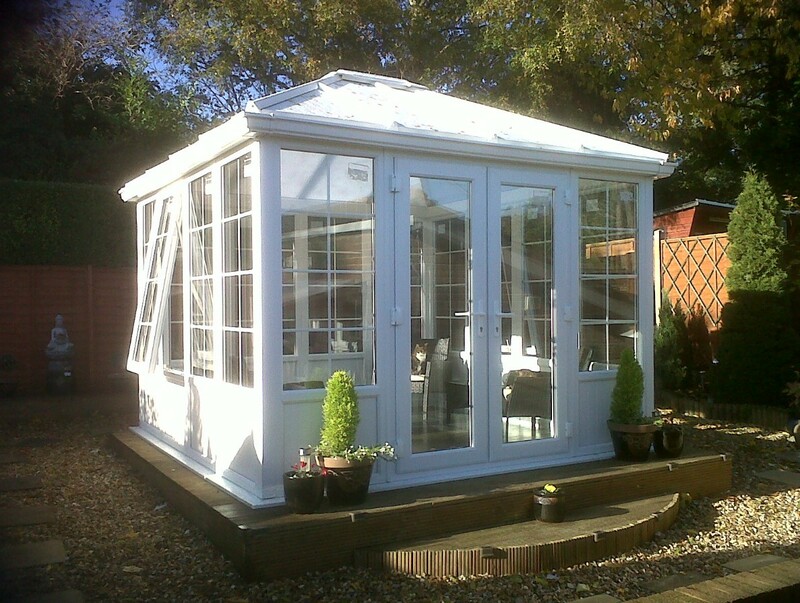 This model can also be supplied with full height glass. 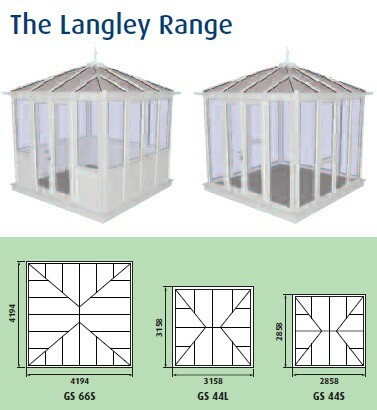 The GZ2 model has French doors and two panels per facet. Two top hung windows are included. The width and length is 3444 mm and a facet width is 1426 mm. Frame height is 2050 mm. As standard, the white PVCu finish is supplied with opal polycarbonate and the Light Oak finish is supplied with bronze polycarbonate. A glass roof upgrade option is available. The Durabase, insulated steel base, brick skirt below DPC and particle board flooring is available, please inquire. The DIY Langley model is a square four facet garden building. As standard it is supplied with 600 mm high infill panels in shiplap. This model can also be supplied with full height glass. The GS44L model has French doors and four panels per facet. Two top hung windows are included. The width and length is 3158mm and height is 2050 mm. The GS44S model has French doors and four panels per facet. Two top hung windows are included. The width and length is 2858mm and height is 2050 mm. As standard, the white PVCu finish is supplied with opal polycarbonate and the Light Oak finish is supplied with bronze polycarbonate. 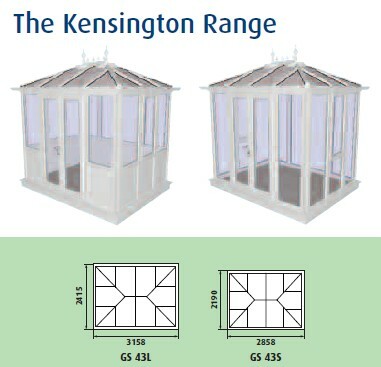 The DIY Kensington model is a rectangular, four facet garden building. As standard it is supplied with 600 mm high infill panels in shiplap. This model can also be supplied with full height glass. The GS43S model has French doors and four panels to the front and three to the sides. Two top hung windows are included. The width is 2858 and length is 2190mm and height is 2050 mm. The Konnect DIY Garden Room system is so simple to fit, panels come ready for assembly straight from the factory to your door just read below to see just how easy to fit the K2 Konnect system really is! 25mm polycarbonate available in Opal, Bronze or Clear.